Grocery IQ— Free. This app is also available for my droid which makes it even better. It keeps a running list of items I need from the grocery store; when I update on the iPad it will automatically update the droid and vice versa. The list can be divided by store which means I can have a list for Wal-Mart and one for Sam’s. It let’s me input the prices to keep a running total of how much I am spending and keeps those listed in my history. Very useful and such a time saver– it even has coupons! Blogsy— $2.99. Now I have been having trouble updating my blog from the iPad. I use blogger and for some reason the two just don’t like communicating. That is where the new app Blogsy comes in. The app is new on the market and I mean new as of this week. Right now it has an introductory price that will change with the next update. It is compatible with both Blogger and WordPress. You don’t even have to know HTML code! (though I have to say, I am getting better at embedding the codes for links). Blogsy allows you to grab links and images from the integrated browser, Google Images, YouTube, Picassa, and Flickr. Simple and easy just like it should be! Twitter— Free. I use to be very anti-Twitter, but I have since discovered that it is a great networking tool. I am connected to authors, librarians, bloggers, and tech news. It keeps me up to date on the things that I need to know about. 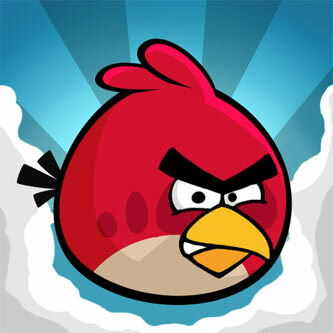 Angry Birds— Free. I am not obsessive about this game, but I can understand how some might be. It reminds me of an old shareware DOS game where these huge monkeys held on the top of these buildings and the object was to throw bananas at other buildings and helicopters. The one thing I will say about it is that it is very useful to have when you are sitting waiting somewhere with a five-year old who doesn’t want to sit still…it even works on husbands! Do you have a favorite iPhone or iPad app? Any for the droid?